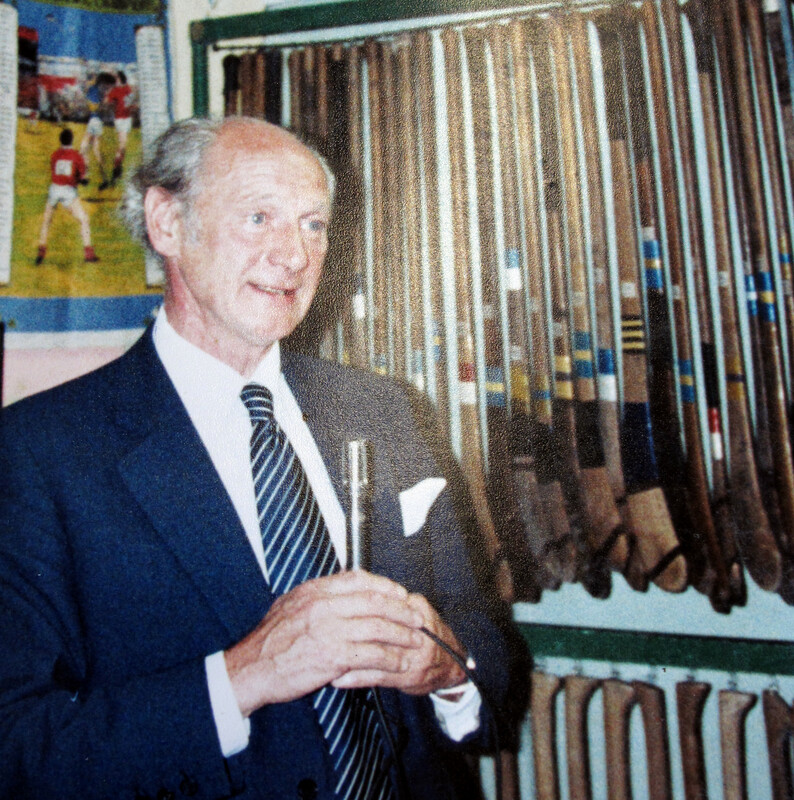 Jack Lynch’s hurley is one of over four hundred in the Lár na Páirce collection. With the maker, HOBBS, prominently displayed on the handle, and modest red and white bands painted across the timber, there is nothing extraordinary looking about it. Part of the grip is broken off and written neatly on the bas is the name, Jack Lynch. All hurling followers are aware of Jack’s outstanding hurling and football record, the most impressive part of which was six All-Irelands in a row, 1941 to 1946, five hurling and one football. His intercounty career spanned the years 1936-1950 and his ability was recognised by his selection on the Hurling Team of the Millennium and named as an All-Time All Star in 1981. During his playing career he won eleven county titles with Glen Rovers and two football with St. Nicholas. Jack Lynch was involved in many epic encounters with Tipperary. One of the greatest was in the 1950 Munster final at Killarney. The overflow crowd of 55,000 kept encroaching on the pitch as the game progressed and the excitement grew. Referee, Bill O’Donoghue of Limerick, had to stop the game for ten minutes in the second half until the pitch was cleared. Tony Reddin recalled the intensity of feeling among the supporters as they surrounded him in the Tipperary goalmouth. Anytime a ball came in he was teased, barracked and even pushed. He remembers one spectator catching him by the jersey as he ran out to clear the ball. Playing in front of him was Jack Lynch and, in the days when the goalkeeper was the target for opposing forwards, Tony came in contact with him a number of times, flattening him during one clearance but avoiding being crashed into the net on another by swerving at the last moment. In spite of the rivalry he recalled how Lynch appealed to the crowd, albeit in vain, to move back from the goals. Jack Lynch, who was first elected to the Dáil in 1948, went on to become leader of Fianna Fáil and Taoiseach and eventually retired from the Dail in 1981. There was a rapport between him and Tony Reddin and when they met at Christy Ring’s funeral, Jack refereed to Tony’s ability to stop turnip seeds which, would make Tony the second best goalkeeper from the Lorrha club. A predecessor of his, Paddy Gaynor, who played in goals in the nineteen-twenties, was reputed top stop midges! Aye, indeed! In spite of all his achievements, Jack Lynch retained the common touch, always remained a manof the people and was a frequent visitor to Davern’s Pub in Cashel on his way to Cork. I remember being in the pub one Sunday afternoon when he arrived in from the Seán Treacy commemoration at Kilfeacle with his wife and a few friends and he ordered the drink, paid for it and brought it down to his party. No airs or graces there!